Singapore first Trick art museum from Korea opens it doors at Resort World of Singapore. Here you can take unbelievable 3D like photos from the use of mainly 2D artwork. Trickeye musuem originated from Hongdae, Seoul in December 2010. It has seven museums worldwide. 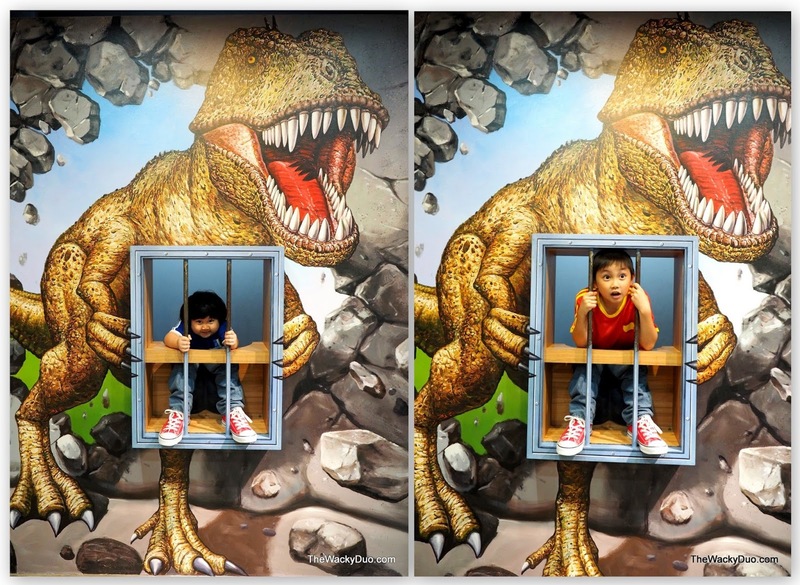 This interactive museum consist of 6 family friendly zones consisting of World of Masterpieces, Safari Kingdom, Star of Cirucs, Dreams of Fairy take, Love in Winter and Adventure Discovery. 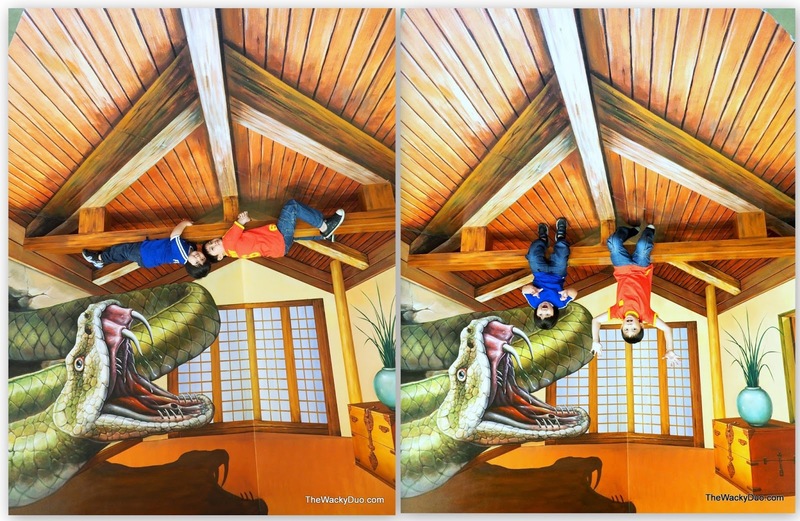 Since we are *ahem* veterans of Trick Art museum, we shall share 12 tips for a rolling good time for families. If you are bringing kids along, let them dictate the pace of the visit. Encourage them to be comfortable and let them be themselves. If possible, ask them to go wild. Let loose a little and they might just surprise you with their willing ingress to pose. 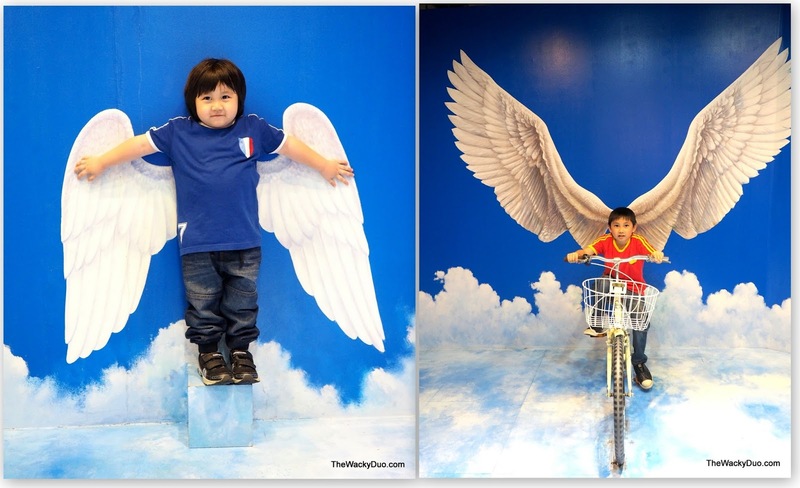 Trickeye museum is one place where you can throw proper mannerism out of the window. This is the place where you ARE allowed to go crazy or wacky. The wackier you are, the better the shot! And do join them in the act as well. After all you would not find a better place to let loose in front of the kids. So if you can't beat them, join them.However as wacky as we are, we need to be considerate too, do not hog the artworks. Take your photos and move on to the next one especially if there are queues. Go ahead, Let your kids climb, grab, stand on the exhibits. No one will ask you to stop. In fact is is recommended. We kid you not.Better still, there are actually exhibits that forces you to do just that for the perfect shot! Forget about the 'look at me and smile' poses, they do not work here. Instead let the children explore their creativity. You might have a surprise or two when you view the final outcome . The 3 D effects works best when you take the photos from the right angle. Look out for ' Photo Point ' stickers on the floor. They will point to you the right way to snap a photo. If you need help on the pose there are suggested ways to pose with the artwork. Look out for these posters by the side of the exhibits. There are also exhibits that might need you to view it from a different angle for the 'right look', all these instructions can be found on these posters. To get the best photo, you probably have to crop your photos at the end of the day for a perfect composition. The photos on this post are mostly crop and adjusted for the perfect look. The Trickeye Museum is separated into 6 main zones . There are over 80 art pieces along these zones. This means there are an average of more than 10 art pieces per zone. Given the large number of choices, move to an empty art piece to take your shot instead of spending time waiting for a popular piece. Go in groups of 2 or more. We think max 4 to 5 in a group would be about right. Avoid large groups as it would most likely mean you would face bottlenecks when it comes to taking photographs. If you are a couple, do bring a friend. You might need a 'photographer ' for those artpieces made for groups. There are art exhibits which caters to single as well as group photos. It is quite balance in our opinion. So make sure the child is well rested and well fed. This would make them fully charge for the session ahead.The following pictures are proof of happy kids making photo taking a breeze. 8 Strike a pose... corrections, strike many poses! Here are many ways to pose for a photo. We suggest you to try different poses for the same shot. You will never know what you might end up with. So be bold and creative. Don't be afraid of looking foolish, everyone else is doing it at the Trickeye museum, so pose away! The individual room at the Trickeye Museum is rather big. However we do not suggest the use of strollers within . You might get into people's way and may irk an odd childless man to write an editorial in Straits Times. Either way a stroller is unnecessary as the museum is not that big. Moreover the stroller might just get into the photos of others. Surely, as parents we are more considerate than that. 10 Comfy Clothes Wear comfy clothes. We recommend T- shirts and shorts. There will be art pieces that requires you to lie down on the floor or stand at an odd angle, so be as comfortable and modest as you can. The best time to go would be weekdays evenings. We were there at about 730pm in the evening and there was no much crowd. As such we manged to take tons of photos and complete the museum tour in slightly over an hour.Less crowd means you have more time to pose for photos without feeling rushed. With young children, the extra time is a blessing.Avoid weekends. With the added tourist crowd, you might need to jostle for a chance to take your favourite picture. Not ideal timing for family with young kids. 12 Don't forget your camera! Last but not least, bring a camera along. It could be the high end DSLR or the mobile phone. It does not matter as you would still likely get the shot you would like. We do think a tripod is unnecessary , unless you are going alone. All he photos taken are without tripod. In addition, there is no need for flash as the place is very well lit. Flash might actually create bright spots on the final picture and spoil the look. To conclude, we love the Trickeye Museum. In fact we took over 300 shots in an hour! Most of the photos turn out pretty good, thus making it hard to choose the right one for this review. To see more, join us at our Facebook page. Thanks to the kind folks of Trickeye Museum , we are giving away 3 Tickets each for 2 readers. Complete the following sentence in the facebook link " Tickeye Museum is ________ " Be creative with the answers! Prize are subject to change by the sponsor. Validity will be disclose to the winners. Winners of past 1 month giveaways on thewackyduo.com will not qualify for this giveaway. Hi Trick Eye Museum . Thanks for your interest in using our photos . Drop us an email at thewackyduo@yahoo.com with your request details . Thanks !